Construction materials expert Dr. Jason Weiss from Oregon State University’s School of Civil and Construction Engineering leads the Sierra Nevada Concrete Association’s Annual Concrete Expo, Thursday, April 27 at the Peppermill Resort Casino. The day-long expo will reveal the latest techniques in creating the world’s most durable and sustainable concrete pavements. Dr. Weiss will present cost savings techniques and methods to increase concrete performance. Weiss is the also the director of the Kiewit Center for Infrastructure and Transportation. The afternoon session features Clay Slocum, pavements engineer for the California Nevada Concrete Association. He will be discussing Design and Construction of Concrete in Parking Areas, Local Streets and Roads. The lunch presentation will feature an update from the University of Nevada, Reno’s Concrete Canoe Team, winners of numerous regional and national titles in the American Society of Civil Engineers competition. The Sierra Nevada Concrete Association (SNCA) is an active force in promoting the use of quality concrete for all types of construction, from tilt-up logistics and manufacturing facilities to lower-life cycle cost concrete pavements for roadways and parking lots. UNR Continuing Education Credits are available. Registration is $80 and a continental breakfast, break snacks and lunch are sponsored by the SNCA and Expo sponsors. Approximately 150 contractors, architects’, building officials, engineers, public works officials and construction consultants are expected to attend the day-long symposium. On line registration is available at www.sierranevadaconcrete.com or call (775) 852-6551. The Sierra Nevada Sierra Nevada Concrete Association (SNCA) is an active force in promoting the use of quality concrete for all types of construction, and to benefit all aspects of the community. The SNCA provides public officials, engineers, architects and private developers with access to information regarding concrete in the Northern Nevada/California region. 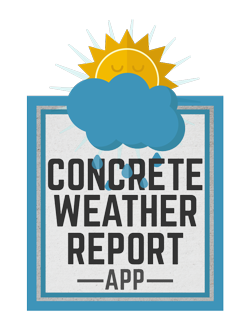 Know the concrete pouring conditions for today and the next four days for any city anywhere in the world. Available free for Android and Apple mobile devices as well as any tablet or computer. Receive the forecasted evaporation rate based on:average wind speed, relative humidity and air temperature. Get involved, by joining one of SNCA's committees. Consider one of these: Promotion, Legal, Membership, Technical/Education, Pavement and ICF.